Natural, organic, fresh, premium fragrance. Not a cover-up! Stops odor at the source while improving environmental air quality. Economical concentrated formula. GROUT SLAM is a powerful tile and grout cleaner that quickly and easily emulsifies and loosens the toughes soils and stains for easy removal. PET MAGIC is a powdered concentrated odor counteractant that uses the natural power of oxygen to permanently remove pet odors and stains- all in a single step! CITRUS SLAM will tackle the heaviest greases and the toughest soils. It suspends dirt immediately upon contact and should be used in heavy-duty applications. A versatile and affordable entry-level truckmount that packs a big punch. Exclusive features which make it ideal for dedicated hard surface cleaning. Two wands, two cleaning speeds and a smarter water conservation system. Purpose built for restoration work. A specialist in its field. Easier, quieter and ready for your greatest cleaning challenge. Van-powered truckmount with the heat to make your competition sweat. The industry’s hottest van-powered truckmount is now hotter than ever. The next generation of direct drive truckmounts. 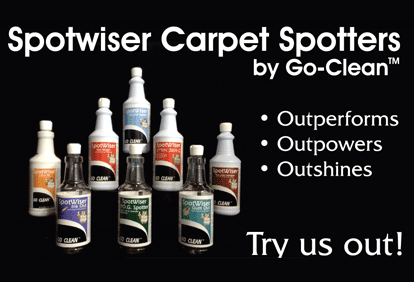 The Cleaning Source carries equipment approved by top carpet cleaners in the industry. Used daily across the country. See all of our equipment. A good chemical product can save you time, money, and energy. You're at the right place. Professional chemicals by professional people. See all of our chemicals. We run specials on a number of popular products for our customers on a frequent basis. See our current promotions. See all of our specials. "Like" Us On Facebook For Special Promotions! "Follow" Us On Twitter For Exclusive Discounts!